So most of you all know that I love to test things out when it comes to marketing. I like to see what works and what doesn’t and then evaluate it. We’ll I came across a new site I found via twitter called That’s My Folio. It’s brand new and get this, it’s only $12.50 a MONTH for 15 images. With that low a price, any illustrator (even newbies trying to break into the field) can afford to test it out and they give you your first month free (use promo code 1month). Since I only subscribe to one online portfolio listing site right now, I though I’d give it a try. I love how easy and clean the site is and how big the images show and since it’s just starting up, you really have a chance to get noticed on there. Do you have a background in illustration or publishing? Patrick has a Bachelor of Fine Arts degree with an emphasis in marketing. He has done some marketing for Prairie Breeze Gallery in Mitchell, SD. He has also been working on website marketing independently for the past 7 years. Lanette is an admirer of art and creativity in many forms, with an Accounting diploma and over 20 years of customer service and sales experience (6 of those with a local bookstore). She is learning more about marketing by attending local business conferences and workshops. Why did you decide to start a portfolio site with all the others out there? It started with Lanette’s desire to start her own business, grew as she and Patrick brainstormed on what types of businesses either or both of them could do, gained substance as they focused on what they wanted their lives, careers and world to be about, and jumped onto the World Wide Web as an easy-to-use, professional site that still maintains a personal feel, geared to help illustrators get their talent shown to the world. We are not planning to overtake all (or any) of the great portfolio sites that are already available. We just want to offer a smaller, more personal and affordable site where illustrators can feel like more than “just another artist”. What type of advertising do you do to promote the site and the artists there? At this time, we are focusing on social media advertising and have a presence on Facebook, Twitter, and LinkedIn. We also believe word-of-mouth communications via blog posts and articles and networking are very valuable. We have recently begun placing ads online on some blogs, also. Our site has been developed to be as search-engine friendly as is currently possible, including an opportunity to upgrade with mobile web use in the near future. We are networking at local book fair/festivals as well as small business conferences and workshops. Within the website itself, we are using a featured artist spotlight and a blog area that we hope will help create some “buzz” about us. We do welcome any suggestions for marketing and advertising that anyone might have! 2) Leave a comment on my facebook page under the contest status update. I’ll draw a name next Monday, July 4th. Good luck!! And the winner of the 1 year subscription to That’s My Folio is the fab, ! Congratulations Wendy! I am always looking for ways to promote my work. It has been word of mouth for the most part, and I am doing my best to try to “up” my online presence. Struggling like mad, but giving it my all. Thanks for letting us know! I would love to be a part of this new website! I’m going to follow them now on fb! This is really cool! I have been meaning to get on an online site. That’s My Folio looks fantastic!!! 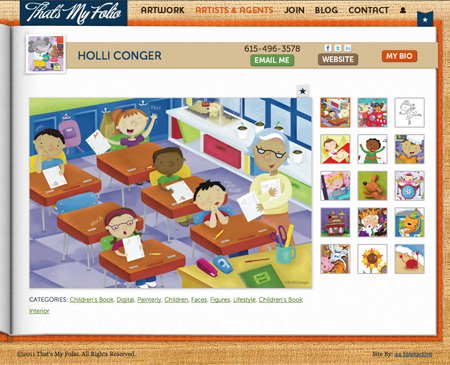 Thanks for this Holli – I recently learned about this site and would love to win your contest! Thanks for sharing this information and I’d love to win the one year subscription, so please count me in! The site looks great and I’m always looking for more promotion avenues. Great site! Thanks for sharing it, and the contest!! This site looks awesome! Thank you so much for sharing. Thanks for asking them questions! That makes it so personal to find out who is behind the great site! Hi Holli – cool giveaway and great site. Thanks for the giveaway and congrats again on your new addition. Wow, that would be incredible. Living where I live, the markets are very small and this would be the kick I would need. Your little book is inspiring. I love the way you do things. What a surprise! Great info and a great offer! Thanks for continuing to put out good vibes. Thank you so much for writing about thatsmyfolio… They do have a very attractive and professional interface, definitely worth a try! Sounds like a great new site! Cool – I’m going to tweet it as well… but wondering if the tweet should have a space between “RT” and “@HOLLiCONGER” ? right now they run together, and may not show up in your feed…. to place my samples and I like the feel of the website. Nice portfolio site. It is good to have something smaller as an alternative to the portfolio sites which have gotten so huge. Very reasonably priced, thanks for the interview with the people behind it. I’d love to try it out. This looks like a great opportunity to try it out. Thanks for sharing and for the great giveaway! I’ve been following you for some time and have been inspired by your posts–now to put it consistently into practice for myself! The new portfolio site looks great, so easy to navigate. I did find I needed to scroll to view some images in full which were large on my screen, though this may be down to screen resolution! If they can keep this portfolio site small so that artists don’t get swamped by numbers and lost in the images, it would be wonderful. However, I fear it will become popular very quickly, and therefore lose the benefits of a small portfolio site simply because of its own success. I really do hope this works out well for everyone, site owners,artists and clients alike. Boy do I ever need this. Let us know if you get any results from it. Thanks for sharing this. I fall into that up-and-coming illustrator category and always looking for new ideas to market myself. I love the look of their site and can’t wait to sign on. Thanks Holli for sharing this info. I was very much interested in the background info of this site and how they compare themselves to others. It looks like a great site with the clarity and the way they present the work. I was uncertain due to it being so new. But the info you provided really helps!! And being able to do a giveaway!! awesome! Wow, a free one year portfolio would be great! Really nice portfolio site! I would love to win this!! This new illustration site is well on it’s way to great popularity! Winning would be fab-u-lous! Thanks for sharing Holli! I have wanted an online portfolio for years now. Ready to move forward and live a creative dream like none other! Thanks for the opportunity! Love your art, Holli! Awesome…thanks for the opportunity and I will look into this! Thanks Holli! Can’t pass up a chance to win a portfolio! Thanks for sharing – I love your site, btw. You are such an inspiration!